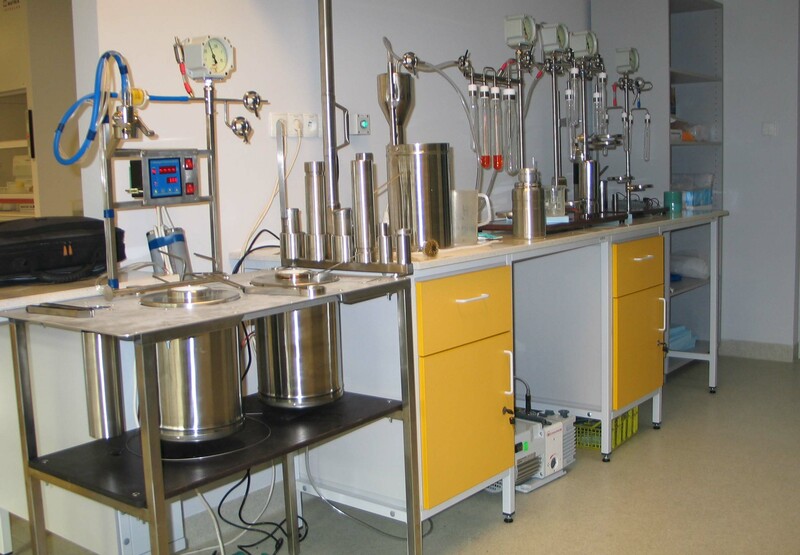 This Equipment (benzene synthesizer) is developed to produce benzene used to determine Radiocarbon content. Benzene is used as measured media for conventional radiocarbon dating based on liquid scintillation counting (LSC). Thus depending on available datable Carbon benzene line easily produces of 0.1-6.0 g benzene per sample. We suppose to use up to 7 g benzene per sample counted by LS Spectrometer. Creation of minimum volume Vacuo Benzene Line. of All Substances in the Benzene Line during of benzene probe preparation. Ultimate vials for C-14 LSC. I.e. benzene production and all around. - Charring of wood, peat, humic acids, collagen etc. into a Li alloy of carbonaceous gases produced by the controlled thermo-destruction of organic materials under vacuum conditions. - Above technology widened application of conventional C-14 analyse equipment for different kind of materials. Reaction vessel is the Heart of Benzene Line. Reaction vessel is involved in the high T and low T processes. It serves to synthetize lithium carbide by performing of chemical transformation reactions using C of any kind of carbon containing studied material and lithium metal. 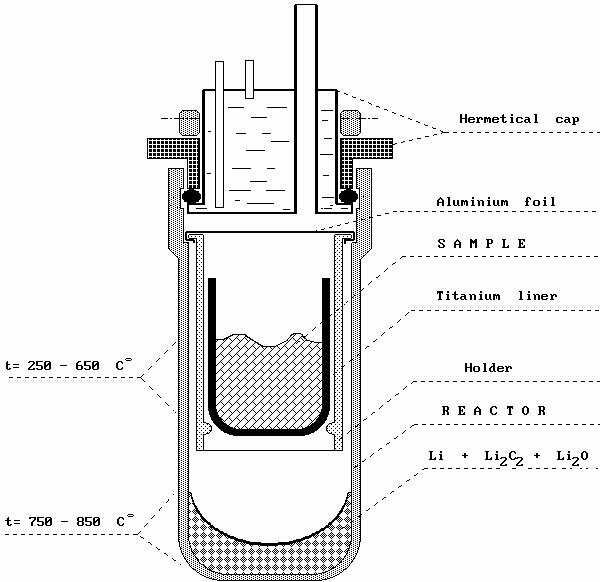 It is covered with hermetic vacuumed and water cooled head and it works at 750 - 850 OC as it was described serving for Vacuum Pyrolysis at 1998 [ Skripkin and Kovaliukh, 1998]. - Benzene purification by sulfuric acid treatment and by sublimation. We recommend Teflon vials of extreme long durability for optimal C-14 LSC (spectrometry) in benzene, which have excellent technical performances: extreme measurement efficiency, low background and low benzene leakages. 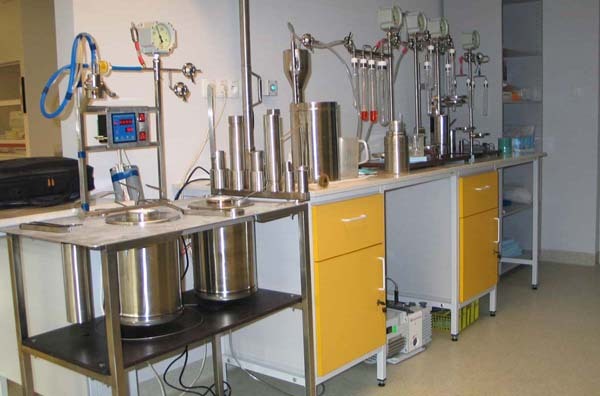 Benzene Line Apparatus is Chemical Laboratory Equipment set for benzene production to be used as counted media for C-14 LS Counting. Radiocarbon Analyse Machine. Setting up a radiocarbon laboratory and personel training. Some parts of Benzene Line (benzene synthesizer), particularly traps could serve as portable C-14 dating equipment which are used to collect carbon dating sample materials like CO2 and carbonates.